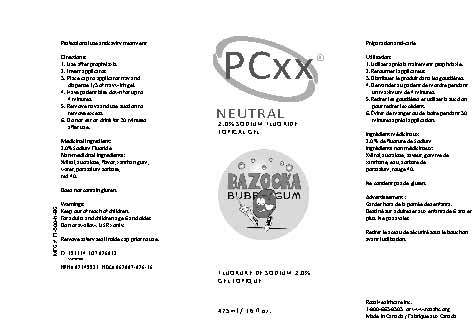 Proprietary Name: Pcxx No Flavor Neutral F What is the Proprietary Name? Pcxx No Flavor Neutral F with NDC 62007-100 is a a human prescription drug product labeled by Ross Healthcare Inc.. The generic name of Pcxx No Flavor Neutral F is sodium fluoride. The product's dosage form is aerosol, foam and is administered via dental; topical form. Dosage Form: Aerosol, Foam - A dosage form containing one or more active ingredients, surfactants, aqueous or nonaqueous liquids, and the propellants; if the propellant is in the internal (discontinuous) phase (i.e., of the oil-in-water type), a stable foam is discharged, and if the propellant is in the external (continuous) phase (i.e., of the water-in-oil type), a spray or a quick-breaking foam is discharged. Start Marketing Date: 02-24-2019 What is the Start Marketing Date?